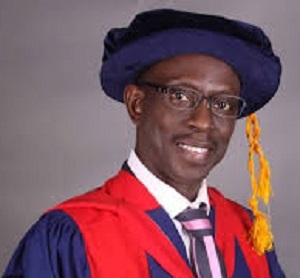 Olanrewaju Fagbohun is a professor of Law and also the Vice-Chancellor of the Lagos State University. He was formerly with the Nigerian Institute of Advanced Legal Studies where he served at different times as both the Director of Studies and Director of Research. His publications have been cited around the world. He has co-edited 8 books and wholly authored a book titled "The Law of Oil Pollution and Environmental Restoration: a Comparative Review"
His research works have attracted both domestic and foreign funding from State Governments; the Federal Government; the South African Government through the University of Kwazulu-Natal; the European Commission under the 7th Framework programme; the World Bank; the International Bar Association; the UK Development for International Development; the United Nation Development Programme; the Global Enviromental Facility and the Private Sector. He has served as the Editor, the Editor-In-Chief of a number of peer reviewed academic journals, and also chairs a number of editorial advisory boards. Aside other law courses, he has consistently taught various couses in Environmental Law both at under-graduate and post-graduate levels in the last 20 years. Professor Fagbohun has served as member and Chairman of different Committees (national and international). He was a member of IBA 18-man Special Expert Task Force on the Climate Change Justice and Human Rights; and Law and Policy Experts, Think 20 Summit/Global Policy Dialogue Platform Conference on Sustainable Development. On account of his significant contribution to Scholarship and Research in Environmental Law, he was awarded the Chike Idigbe Distinguished Professor of Law Chair by the Nigerian Institute of Advance Legal Studies in 2012. His research is focused on issues of sustainable development, sustainable livelihood, environmental protection, law and governance, and the environmental rights of indigenuous groups.